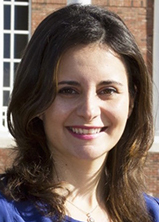 DSA Fall Conference/Education Sessions & Learning/Featured Speakers/Haya Ajjan, Ph.D.
Dr. Haya Ajjan teaches data analytics and information systems courses in Elon’s undergraduate business and MBA programs. Dr. Ajjan has started the Center for Organizational Analytics at Elon University and was instrumental in developing the curriculum for M.S. in Management concentration in Organizational Analytics. She earned her MBA and PhD from the University of North Carolina at Charlotte’s Belk College of Business. Her research focuses on better understanding the impact of technology use on individuals, groups, and organizations. Dr. Ajjan’s research articles have appeared in national and international journals, such as Behaviour & Information Technology, British Journal of Educational Technology, the Journal of Marketing Theory and Practice, Journal of Enterprise Information Management. Additionally, she has presented at numerous national and international conferences, such as International Conference on Information Systems, Academy of Management, Academy of Marketing Science, and the American Conference on Information Systems.